Is it time to replace your gutters? Over time, heavy snow, hail and other extreme Wisconsin weather can cause damage that leads to leakage in your gutter system. After a solid roof, your gutters and downspouts are your home’s second line of protection against water damage. However, time and weather can cause less-than-optimal appearance and performance. Tri-County Contracting can help if you notice your gutter system is leaking, draining slowly, undersized or unsightly. As a locally-owned and -operated company with decades of exterior contracting experience, we know the local climate and what your home needs to stay fully protected. In some cases, your gutters can be repaired rather than completely replaced. 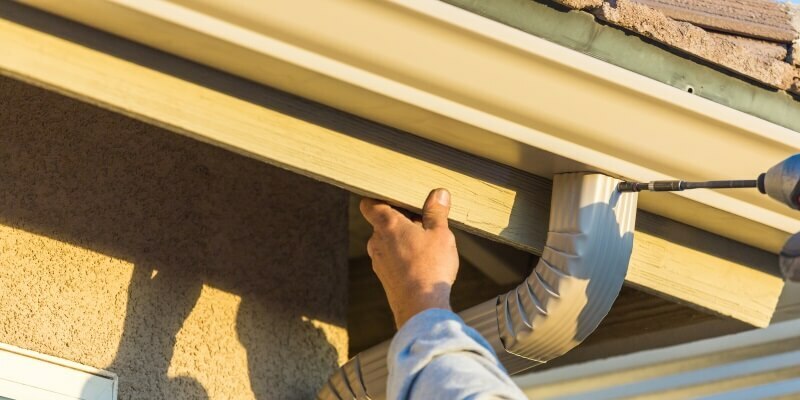 If you notice a couple of small holes or cracks, a single joint or seam is leaking, or if you have loose hangers, you’re a likely candidate for gutter repair. Our experienced team can inspect your gutters and advise you whether gutter repair is appropriate or if new gutter installation is the best option to protect your home. Trees add shade, beauty and value to your property. But every year, those trees shed their leaves – causing clogged gutters and downspouts. Twigs and other debris can also clog your home’s drainage system. Protect your gutters year-round with gutter guard systems that perform in all seasons, including the Raindrop Gutter Guard® System. All of our systems are installed by our professional contractors who are highly trained in gutter installation. Call About Our Advanced Gutter Systems Today! Let’s talk about a new gutter installation for your home, either by itself or as part of a complete roof system. Contact the gutter specialists at Tri-County Contracting by calling (262) 679-6100. You can also fill out our online form or stop by our showroom in New Berlin!